When I was little, my family had a favorite Mexican restaurant that we’d go to for special celebrations- birthdays, graduations, friends in town, etc. My dad would order the same plate of sizzling fajitas and I would always share with him (I ate like a bird back then so ordering my own plate was a waste….wish that still held true). The rule was, eat everything he put on my plate and I could have dessert. Seldom was I ever the first one done with my meal at the dinner table, but when we went to Cielito Lindo (sadly, no longer in existence), I mowed through my rice and beans and scarfed down the tiny fajita taco that my dad would make me as fast as I could because I knew one of my favorite desserts was just a few more bites away. 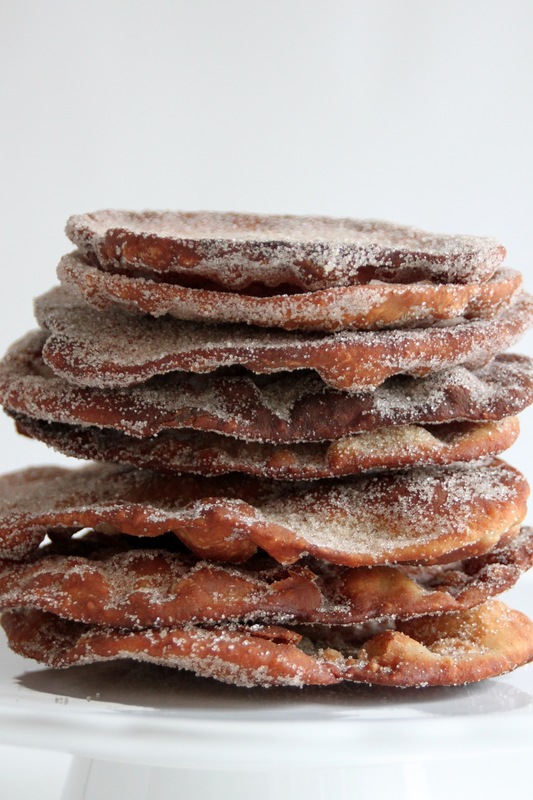 Buñuelos is a treat found in many Latin American countries and made in many different ways. Sometimes they’re round little dough balls (like donut holes), sometimes they look more like churros in long strips, often you’ll find them covered in powdered sugar or honey… but I like them best as round, flat, crispy “tortillas”, covered in cinnamon and sugar…just like I had at my favorite Mexican restaurant. 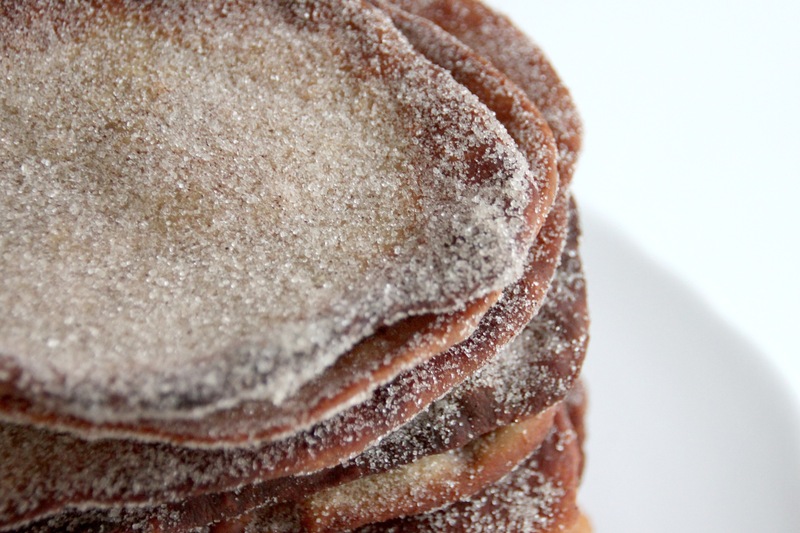 Buñuelos make a wonderful dessert paired with a delicious champurrado (Mexican hot chocolate) or a sweet breakfast treat with a cup of fresh coffee (con leche, of course!). Recipe after the jump. xoxo! Note: These are meant to be eaten right away, they turn soft after a day or so. Yum! I’ve only tried them in ball-shape, but this looks great! Thanks Villy! It’s an OPI color but I forget which. 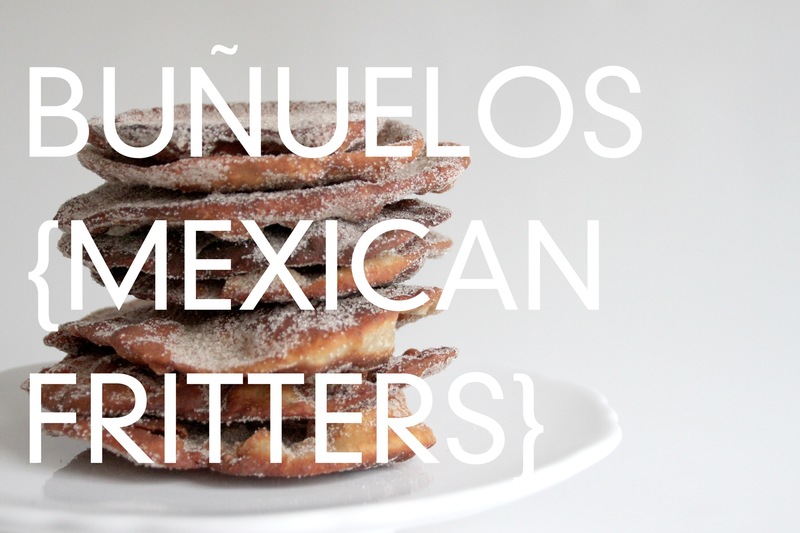 The doughy ball-shaped buñuelos are so yummy too! Paola, you’re killing us!! ROFL These look SO yummy! My favorite equivalent when I was growing up was white bread toasted with lots of butter and then sugar and cinnamon sprinkled on top. My mouth is watering! I loved that when I was a kid as well! SO good! This reminds me of that, yum! 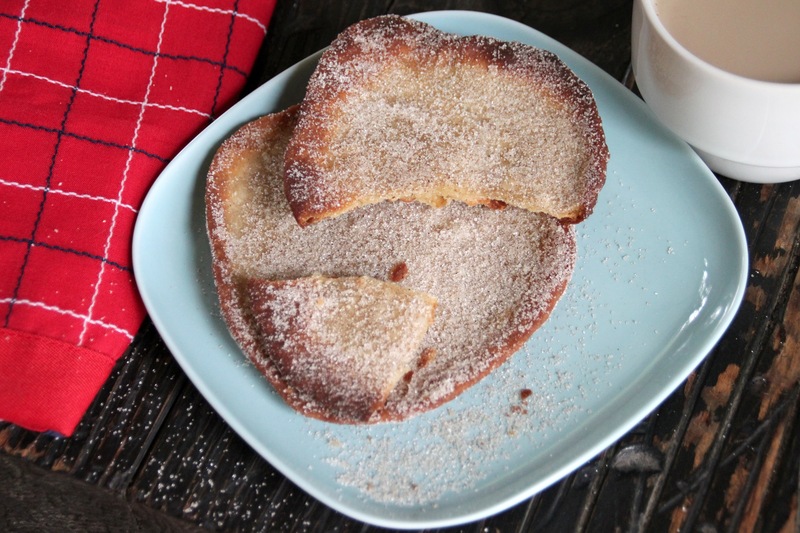 Mmmmmm, butter, cinnamon and sugar on anything sounds amazing! I would definitely finish my dinner for this!